Michigan is known for weather fluctuation throughout the year. But this year we seem to be experiencing drastic highs and lows of winter temperatures. We have already seen salt trucks on the roads, which means pothole season is upon us! 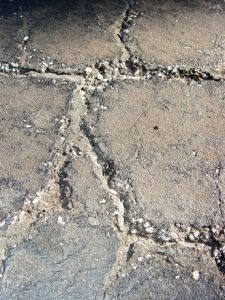 Also, road salt causes damage to our roads and freeways, which only becomes more damaged with the expansion and contraction caused by temperature ups and downs. Do you know where you will get your car serviced after hitting your first damaging pothole of the year? 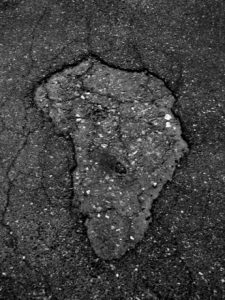 Mr. Muffler is your go-to source for Pothole Damage repair in Southeast Michigan! We all know that the best way to avoid pothole damage is to avoid potholes. Have you ever hit a pothole that you didn’t see? Couldn’t swerve around to avoid one? Drove over what seemed to be a rumble strip of damaged road? We all have done it at least once and gritted our teeth while doing so. Did you cause damage to your vehicle, maybe caused the front end to vibrate or wheel shake? If so, you might need a front-end alignment or tire balancing. Specializing in front end damage repair caused by hitting large potholes, Mr. Muffler can get your car back on the road quickly. Knowing where you will be having your car serviced when the unfortunate event of hitting a pothole has you stuck on the side of the road is important. In addition, Mr. Muffler, located in Westland at the corner of Cherry Hill and Wayne Rd. is available to service your car or truck. We will do an inspection at no charge to you and give you an honest assessment on what damage was done. Whether hitting a pothole caused a tire to blow, knock out your alignment, or caused other damage resulting in unsafe driving conditions, our professional auto mechanics are here to help. Along with front end damage repair, Mr. Muffler is a full service auto repair shop in Michigan. Finally, whether you are in need of routine maintenance, brake repair or replacement, or transmissions services in Michigan, contact us today.